Michael and I talked about politics, the Middle East and other controversial subjects. As we were landing, he said he had a friend picking him up at the airport and offered me a lift into town. His friend, Made, owns a ceramic and furniture export business in Legian–a very friendly Indonesian man with a great sense of humor. Anyway Michael said I should rent a car. At first I disagreed and thought I would just rent a motorbike, but as it started raining more and more, I decided it would be easier and more comfortable in a car. Michael didn’t feel it would be a problem, but then again they drive on the left side in Australia also. Made called a few places on his cell phone and by lunch time there were two Suzuki jeeps outside his warehouse for Michael and myself. He rented the vehicles in his name and simply made me countersign the documents. Very trusting considering I’ve never driven here before and just met the man. My first foray was into Kuta. Crowded midday traffic, narrow streets and trying to find the stick shift with my right hand made for an interesting trip. Of course the tank was empty so I had to find gas right away. I wasn’t aware that there is certain etiquette with pulling into a gas station and I think that my punishment was getting overcharged for a tank of gas. I did fairly well and managed not to run over any motorbikes, pedestrians or other cars. I did find out the boundaries of my vehicle by tapping mirrors with a parked SUV. Once I got out of the city it wasn’t so bad and shifting with the left hand almost became second nature. I had one little mishap, however. I stopped in a little village, just pulling of the road near some shops to look at my map and as I pulled out, I failed to see the two-foot ditch in front of my left wheel. The entire jeep tilted into the air and my right rear wheel was about two feet off the ground. I couldn’t back up since I was on the two opposing wheels and the jeep couldn’t get any traction. All the village people were laughing at me for my stupidity. I got out and was trying to ask for help in Indonesian but I’m not sure if they understood me. Finally, one of the older villagers came over with two other big guys and they sat on the back of the jeep and the others pushed me out. Luckily there was no damage except for my ego. The roads here are horrible and I know why they drive these SUVs and jeeps. There are potholes that swallow entire cars, narrow streets that force you to drive in the dirt to pass another car, and lots of crazy traffic near towns. Roads are not marked and signs are few and far between towns. I got lost quite a few times but people are friendly and curious and got me back on the right track. 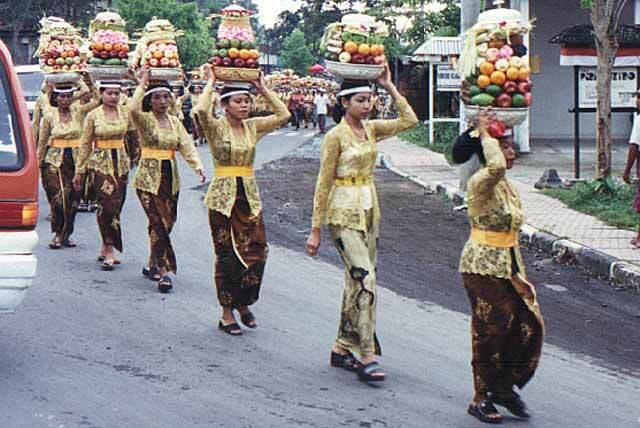 On my way to Ubud, I passed lots of nicely dressed Balinese women in fancy sarongs with huge offering plate perch atop of their heads. They were all going to the temple to make a spiritual offering to the gods. I learned that afterward, they take the food items back to eat. It was quite a pageant and I guess I was lucky to see it since it only occurs once a month. I’m now in Ubud. Unfortunately, in my attempt to get away from tourists, I found one of the trendiest tourist spots in Bali. It is known for the artists and expatriates that popularized the spot in the 60s and 70s. I bought some Balinese art from a local artist who is going to show me his village and studio tonight. I will go to the rice fields and temples later today. I had to buy a sarong to wear when visiting the temples. The man who sold it to me was very impressed that I was going through all this effort to respect their religious rituals. He said very few of the Aussies, Euros and Japanese ever bother to dress appropriately, much less make the effort to even visit these sites. Well, wish me luck on my driving. I’m going to try to do a big loop around the island, but we’ll see.